Here are some quick tips to get you started with your MV1 and here's a link to Ghost's official quick start guide which is included in the box. >> Fully charge your battery before first use - This is very important, it conditions your battery properly to help it retain charges longer over the course of its life. If you received a fast charger with your order you can charge your battery pack through this dock for its initial charge. When you first plug the battery pack into the charger the LED light on the front of the charger will turn red, this means it's charging and when it's fully charged the light will turn green (should take approx. ~2 hours). If you do not have a fast charger, use the included micro-USB cable and a 1A wall adapter (like for a cellphone), and it's recommended for its initial charge to be done overnight (~8 hours). Always remember to keep your battery topped up for optimum performance and so you don’t run out of charge unexpectedly. >> Switch on your vape - When you first attach a fresh battery you will need to switch the vape on by holding down the power button for 2 seconds, then releasing it when you see a single green light. The LEDs will then flash 1, 2 or 3 lights to indicate battery life. The unit is now in sleep mode and can be fully activated by pressing the power button quickly 3 times. You will now see a solid green light and this means you are ready to start vaping. >> Extend the mouthpiece stem - Gently pull out your mouthpiece by about 3/4" until you feel it catch in the groove. After you extend your mouthpiece double check the heatsink to make sure it's fully seated (pushed down all the way). Pushing the mouthpiece down a bit will reduce airflow but depending on materials and draw speed can also increase vapor production. As you get used to the product you will find the position that works best for you. >> Heat Sink - Always ensure the top of the heat sink is flush with the top of the device. The heat sink is the only part of the device that gets quite warm after multiple draws. It won’t ever get hot enough to burn you due to the safety features and don’t worry it is supposed to get hot. It’s called a heat sink and it’s just doing its job - cooling the vapor down so you get cold pure vapor at your lips. 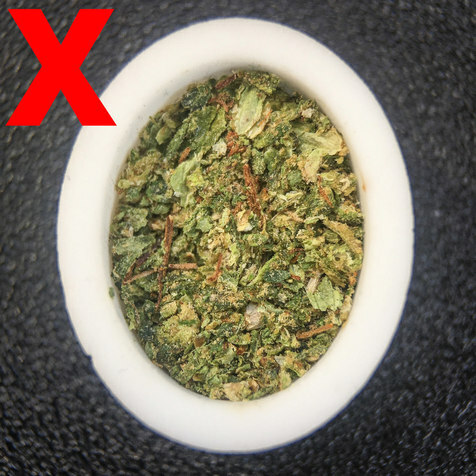 >> WHEN VAPING CONCENTRATES - Load a small amount of wax or other material onto the concentrate pad (a rice-sized to bb-sized amount) and place the pad at the bottom of the crucible. Set the temperature to heat level 6. The first draw you take is programmed to heat at a lower temperature to melt your concentrate into the pad, which prepares it for vaporization. Pull very slowly during this first draw. After 10-15 seconds the vape will vibrate and the heat will shut off. Starting from the second draw you can now pull for the full 15 seconds to get the full experience. Press the vape button and wait a few seconds for the first long vibration, begin your draw and continue drawing with the vape button depressed the entire time. At the end of your draw release the vape button and continue pulling for 1-3 seconds. When vaping concentrates always remember to draw slowly. If you draw too quickly some concentrates will be eviscerated. 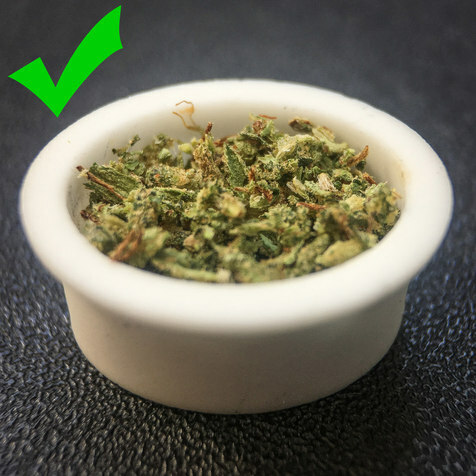 Never try using concentrates on any of the 5 herb settings. Never use liquids with the MV1. >> Changing temperature settings - To change the heat level you first press the main power button for 2 seconds to get it to show the battery indicator. While the battery indicator is being displayed press the power button again and hold for 2 seconds, the vape will now enter temperature selection mode. 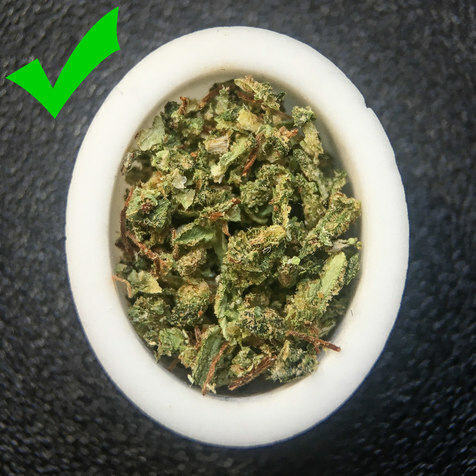 There are 6 heat settings - levels 1,2 & 3 (amber) and levels 4 & 5 (red) are for dry herb, and level 6 is for concentrates only. Press the power button once to cycle through the 6 heat levels, and when you land on the one you want stop pressing the button. The vape will lock in to your desired temp and go back into standby mode waiting for you to vape. The heat setting colors and descriptions are included in the Quick Start Guide which is included in the box. -Can you format this to be bold??? I think it is important and should be stressed. This is from their FAQ section but I think it really needs to be in the Quick Start Guide...perhaps? This is awesome dude, thank you. How long does the device take to shut off when it's in sleep mode? how about mostly herb with a rice grain or even half a grain dab on top or in the middle like a samich on temp 5? Will water hash work? I have some in various mfg qualities. Some grainy, other more taffy like, and of course the just plain hard. Sometimes good material gets made poorly. Looks like a delivery tomorrow for me though the pkg hit town this morning it is not out for delivery last I checked. I only wish ghost were as efficient at getting good product in to our hands as Bud is..
Good tips -- wasn't clear from the Quick Start Guide and the Fast Charger User Guide whether you could use the fast charger for the initial charging cycle. Thanks for the extra info!! Sorry I have to run out for a few and I will answer your other questions shortly, but I have confirmed with Ghost that it is OK to use your fast charger for the initial charge. Give it about 2.5 hours and you should be good to go. Great to hear you can use the fast charger on first use! It's on the charger as we speak. After I get to test it out I'll report back to how it is for me. I am going to try to sleep tonite. Tomorow is a big day, hopefully, I will have the MV1. I will give you the low down on the unboxing. I just got the email, I have been waiting months for! 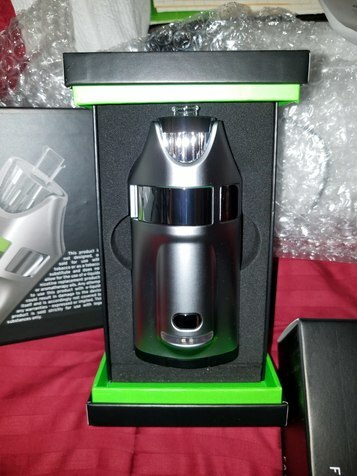 My new addition to my vape family of vapes is on its way! I hope everyone is able to get there's ASAP. If we get this in our hands, and we are enthused with it, but our pre-order was initially for a Rose Gold color model, and say we settled for the Satin Black finish in order to get the fast charger that was being offered to early orders only, are we able to return the device if we really dislike the Satin Black model, for example, in order to purchase the Rose Gold model instead, when it becomes available? I wanted to give the black one the chance to impress, since it appears necessary in order to be one of the first 1000 orders, but will I be able to buy the Rose Gold instead and keep the fast charger, since it was my pre-ordered color? It occurred to me that the removable crucible could be cutting edge tech for those who need to be stealthy. If ever in a situation - just drop the crucible out and it's your portable hookah. I absolutely love when vapes are made to be stealthy. Example - The Arizer Extreme Q has a label on it saying don't put next to any OTHER wifi modems! I clean it out and put it on my computer. I have much more peace of mind with the stealthy abilities. I think the crucible is going to be the #1 thing that will separate the Ghost MV1 from everyone else. Did someone say removable ceramic oven chamber? Do I need to say more? The magazine pack, are you kidding me? This is taking things to an entirely new level of possibilities. I can use it as pre-made dosing capsules. I can take it with me and have 6 sessions ready and able to go, especially with that battery. I can have a dry herb session waiting to go and a concentrated session pre-made and ready to go. The possibilities are endless. I got the email today and I am so excited. I know that everyone will get one. I hope its sooner than later. I will do a write up to post here about the unboxing. Now only if that dang Vape Critic would put down that dang Ghost MV1, we can get more done here.... Where the Vape is that Dang Vape Critic? --- Uh boy probably playing with his grinders again. Whats in your Crucible Chamber? Good question as I wanted the Nickel model myself but I gotta tell ya, Bud was on point when he said they look better in person. The black chrome looks phenomenal (no exaggeration). It's not as shiny as pics depict. The black chrome pics being posted here show it to look way better than what limited pics were available before. I have to eat my negative comments on how this thing looked when I first saw those pictures. It looks great. Would love to see some of the SS version too. Curious, is it safe for the battery to solely charge using the quick charge? Or will this reduce the overall longevity of the battery in the long-term? Hey man. I actually wanted the Nickel color but went with black because I was thirsty. It looks awesome in person! Better than pictures! We love you man. Enjoy ! Love y'all too! Good job, you guys deserve what you earn fr. I'm always for companies getting back what they put in, and y'all definitely put in!